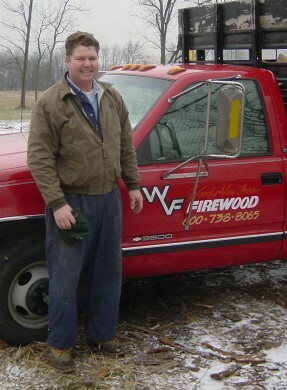 The Woody View Farm's Firewood Company provides quality "hassle free" firewood services to homeowners in Kouts, Valparaiso, and the surrounding Indiana communities. High quality seasoned hardwood delivered neatly in fair quantities at a fair price are Woody View Farm's reputation. 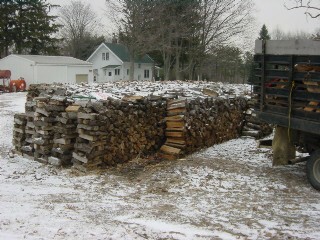 No firewood need is too small or unique, free estimates and flexible delivery schedule make Woody View Farm's Firewood Company the perfect choice for handling your firewood needs. Simply call or email and we'll schedule a convenient delivery appointment. It's that simple. Woody View Farm serves all of Northwest Indiana Including the cities of Crown Point, Dyer, St John, Hobart, Valparaiso, Portage and Chesterton. Seasoned Indiana Hardwood (Usually Oak or Cherry). Split, seasoned, and ready to burn immediately. often called a "face cord". Don't let Tim Stoner's handsome, youthful good looks and witty charm fool you. Tim has been running his successful firewood business for 28 years. He has built a reputation for high quality delivered seasoned firewood that surpass expectations and delight his clients. Through hard work, attention to detail and listening to his clients needs, Tim has developed his business into an efficient operation that can handle all your firewood needs. Information: What type of Wood should I Burn?